Carrots originated in Afghanistan with an array of colors, from reds, purples, red and even black. Orange is not an original color. It is said that the Dutch cross-bred the yellow and red carrot to produce a variety that was the emblematic color of the House of Orange. This carrot quickly became popular and was further developed to become the sweet, succulent orange carrot which is the most recognized color of carrot used throughout the world today (World Carrot Museum). Most carrot cultivars are about 88% water, 7% sugar, 1% protein, 1% fiber, 1% ash, and 0.2% fat. Most of the nutrition in carrots are in the peel and about the first 1/4 to 1/2-inch upper part of the carrot. The so called bagged “Baby Carrots” sold in the market have no nutritional value. The carrots are wedeled down to get the shape and uniformity that they have. Basically the baby carrots are the center part of the original product, were no nutrition is found. 1. Vision: Carrots are rich in beta-carotene, which is converted into vitamin A in your liver to keep your eyes healthy. 2. Cancer: Carrots have phytonutrients in them and this helps to reduce the risk of lung, breast and colon cancers. 3. Heart: Carrots are full of potassium and soluble fiber, which means the vegetable is good for blood pressure, blood sugar and cholesterol. 4. Aging: Carrots have beta-carotene that helps to prevent and repair cell damage, slowing the aging of cells. 5. Skin: Vitamin A and antioxidants found in carrots, protect the skin from sun damage and prevent premature wrinkling, acne and dry skin. 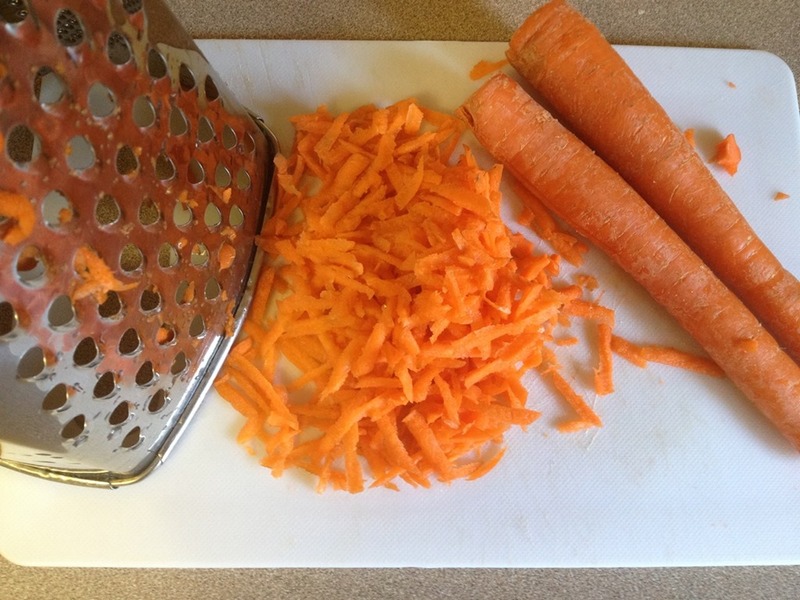 First take the carrots from the cutting board and grate them till you have 3 cups. In a lager quart pot, boil 4 cups of water. Once the water is boiling turn it off and remove from burner. 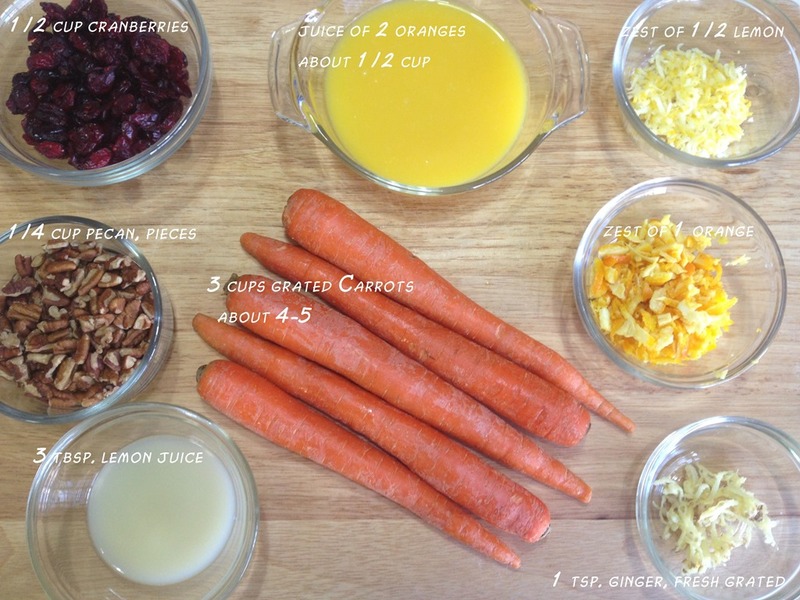 Now place the 3 cups of carrots and the 1/2 cup of dried cranberries into hot water for 30 seconds then drain off water. Rinse with cold water and allow water to drain completely. 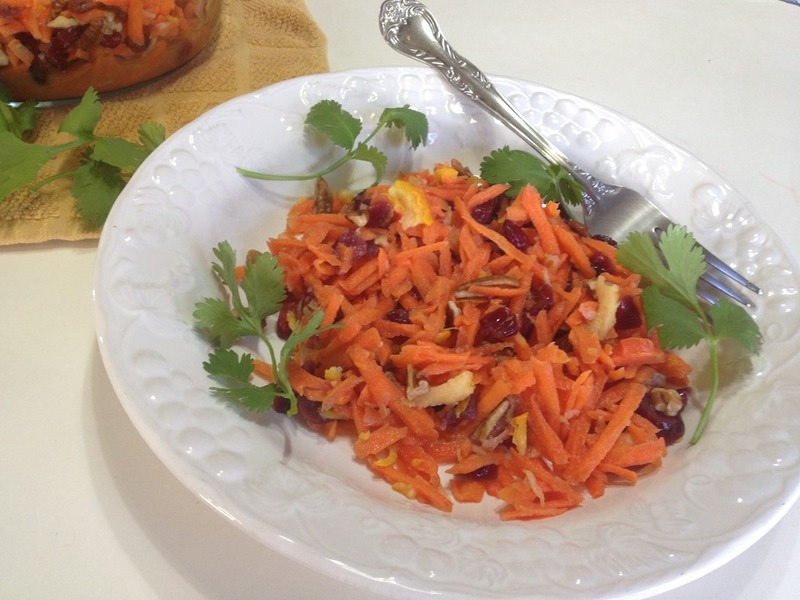 The purpose of the boiling water is just to soften a bit the carrots and hydrate the cranberries so the juices and the flavor of the zests and ginger will enter the shredded carrot with more ease. 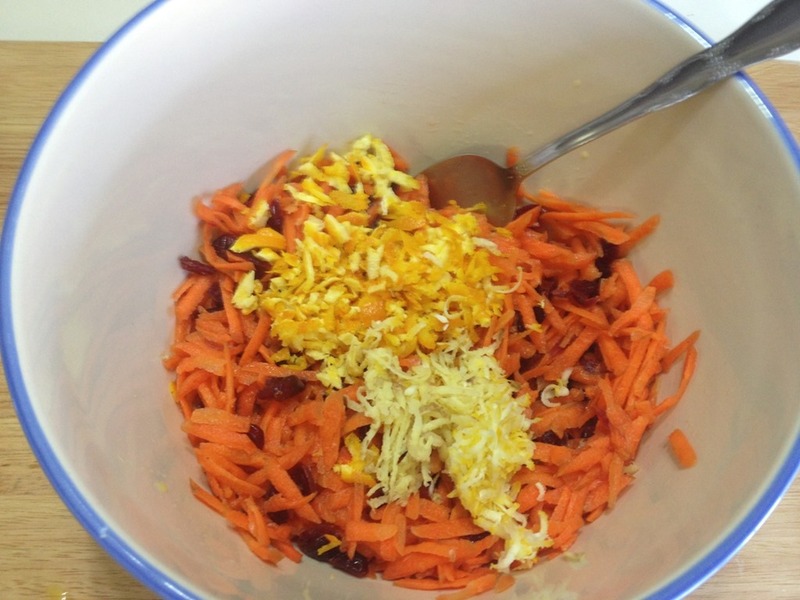 Place the carrot and cranberries into a large bowl. Now mix in the rest of the ingredients from the cutting board less the pecans. Mix all of the ingredients until well incorporated. Place some plastic wrap or aluminum foil over the bowl and put into the refrigerator and allow to chill, about 30 minutes to 1 hour. Remove from the refrigerator and mix in the pecans. Mixing in the pecans last prevents them from getting soggy while the salad is chilling. beetroot, carrot & apple juice aka the caffeine hit! 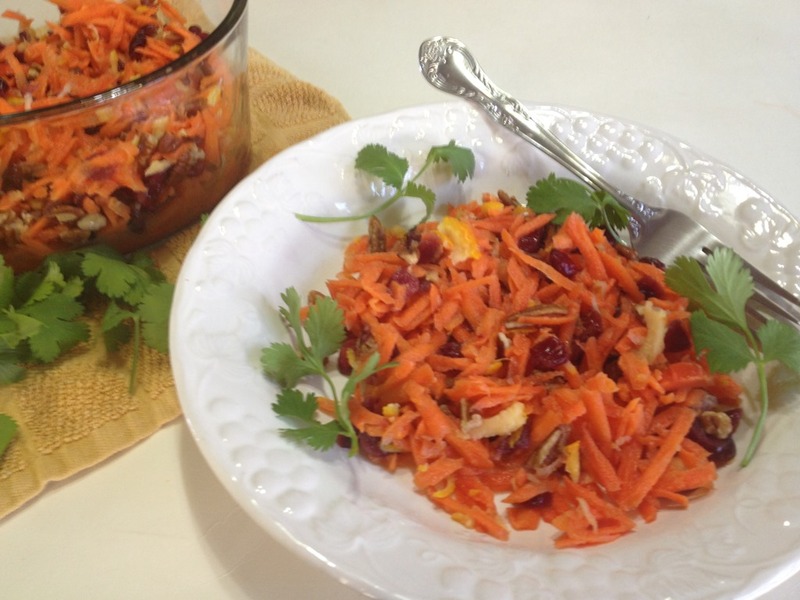 This entry was posted in Side Dish, Soups and Salads and tagged Afghanistan, benefits of carrots, Boiling, Carrot, Carrot cake, carrot salad, Cooking, cranberries, cranberry, Cutting board, Dried cranberry, salad ideas, World Carrot Museum. Bookmark the permalink. This looks like a very refreshing salad, as well as a healthy one. It is refreshing Jovina as well as healthy. I have even prepared it with the other colors of carrots (red, yellow, and purple).